What does it take to rise together? Nausheena Hussain, the co-founder and executive director of a new platform addressing leadership development in her Muslim community, works every day to answer that question. 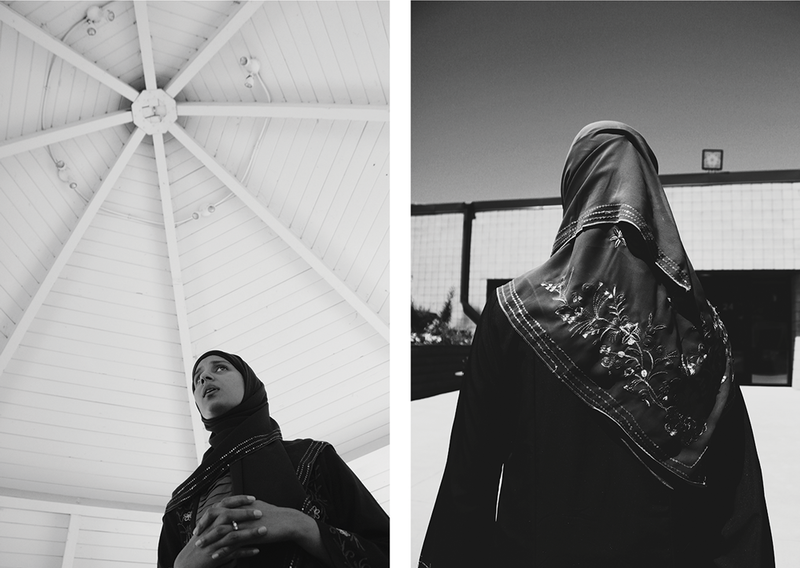 Following Nausheena around during a typical day, Kate Downing Khaled and Fatuma Mohamud capture exactly what it takes. It’s nothing fancy. But it didn’t exist before Nausheena rolled up her sleeves with her community to build it a few years ago. She now serves on their Board of Directors. Because of Nausheena, the Brooklyn Park Islamic Center (BPIC) is one of the few mosques in Minnesota that requires balanced gender governance. Within minutes, Nausheena arrives flanked by her husband, Imtiaz, her teenage daughter, Arshia, and her son, Ayaz. There’s no time to talk. All four go to work unrolling carpets and welcoming guests. Within moments of her arrival an entire community of more than seventy congregants have arrived for jum’ah prayers. As she floats around the room, I follow her with questions while our photographer snaps candid shots. Finally, after a few minutes, Nausheena turns to me with playful impatience: “Can I pray now?” As she sits in worship, on the carpet remnant she unrolled herself, it is the only time in the entire day I see her sit still. As prayer ends on this record-high sunny July day, we move to the courtyard for portraits and questions. Nausheena wears a purple hijab and a tailored black dress. On her feet she wears adidas-style athletic sandals. She doesn’t have time to be uncomfortable. Nausheena—BPIC mosque board member, Bush Fellow, Democratic National Convention delegate, nonprofit founder, former deputy director of CAIR-MN, and mother of two impressive young people—is on a mission. Her mission, and the mission of her new nonprofit, Reviving the Islamic Sisterhood of Empowerment (RISE), is to amplify the voice and power of Muslim women. As we snap photos, I hold her phone. 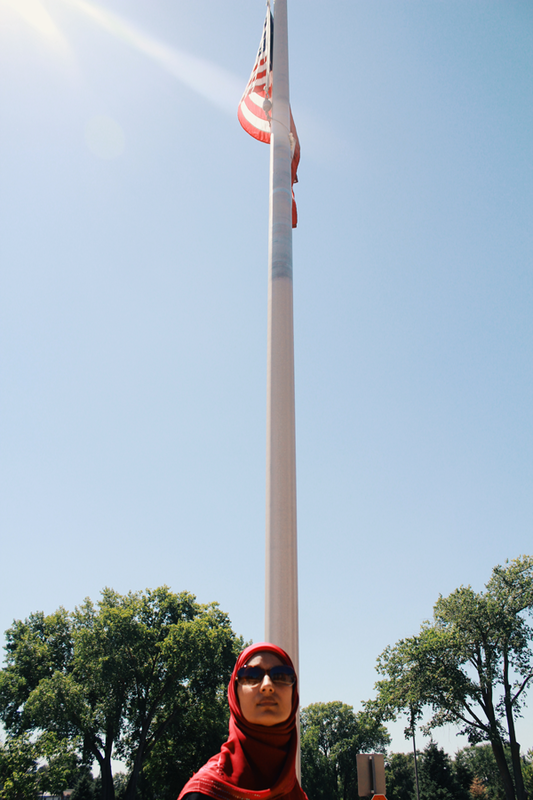 Nausheena is waiting for a call from the mayor of Brooklyn Park in light of a recent anti-Muslim incident that occurred at a nearby intersection. Her work doesn’t end in Brooklyn Park, Minnesota. Later, we sit in the green room at Twin Cities PBS where she waits to share the story of RISE with all of Minnesota on camera with Twin Cities Almanac. “I’m nervous,” she admits. Nervous sometimes—but always determined. She gets over her nerves quickly and soon we’re immersed in energetic conversation. 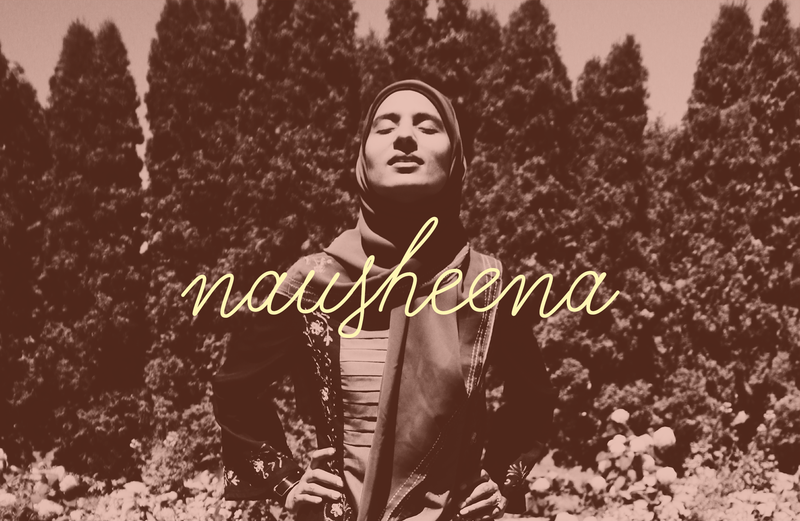 Nausheena says it’s time for Muslim women (and all women, really) to show up. “Someone once told me that you want to be at the table, or else you’ll be on the menu. Well, Muslim women need to be both at the table and on the menu. Because the menu is policy and policy had better include me.” Building power for Muslim women has taken her all the way to the Democratic National Convention in Philadelphia. And like the women she mentions, her home life and work life are completely intertwined. Family life is a team effort. That demonstration of simplicity guides Nausheena. She doesn’t let traditional roles or unachievable expectations get in the way of action. “It’s 2:27, I have to be somewhere in three minutes,” she says with a smile. It’s time to keep moving. 2016 is the year of civic engagement for Nausheena and RISE. 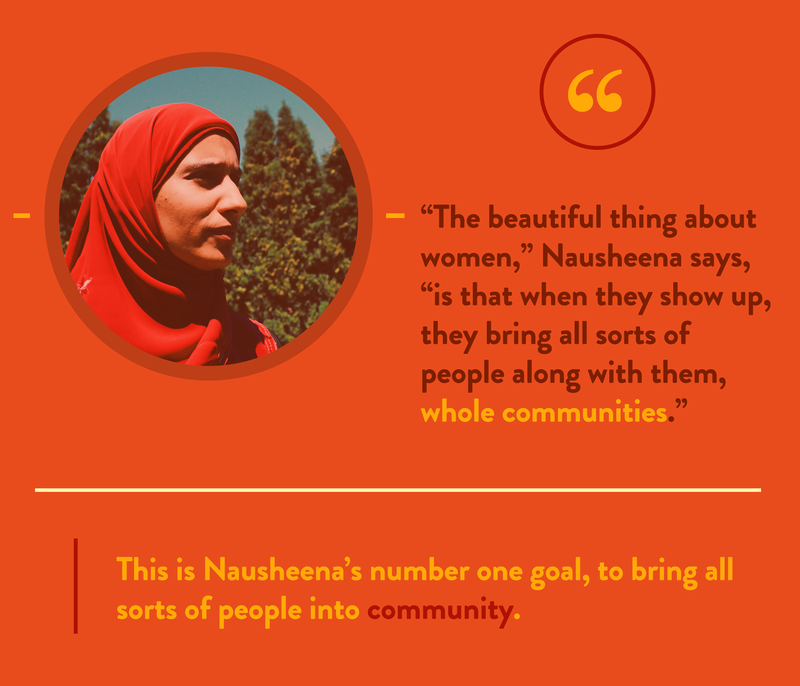 Nausheena is the living, reflective, and relatable example communities crave. Anyone who meets her—even once—can see that she’s the humble engine powering her organization’s catapulting impact. To demonstrate democracy by and for Muslim women, RISE recently held a caucus training. 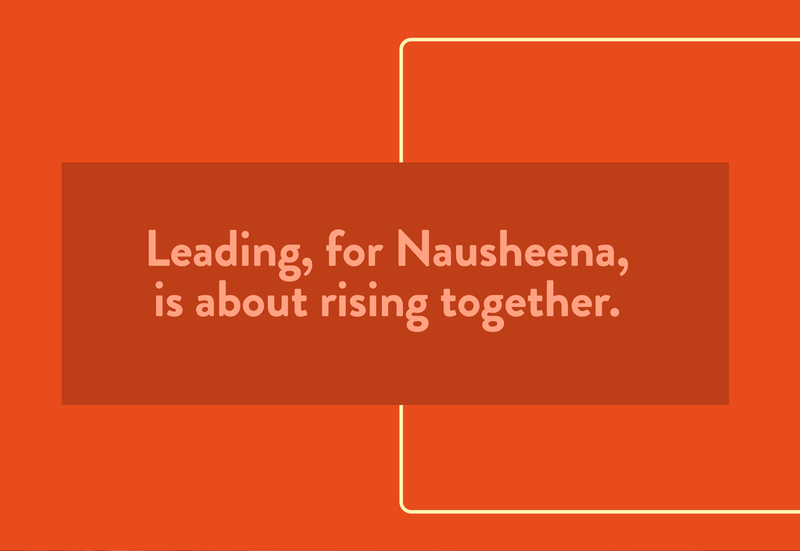 And like the women Nausheena references, she isn’t here to lead alone. Her Bush Fellowship is helping her recognize that a traditional hierarchical leadership model isn’t what works for women or for her community. She’s bringing her daughter along while lifting up her peers. As a partner organization to the Bush Foundation, Pollen often features, profiles, and promotes the work of Bush Fellows. The Bush Fellowship Program is distinctive in its flexibility, allowing individuals to articulate what they need to become better leaders and then providing them with the financial resources (a $100,000 grant), guidance, and networks to make it happen. Applications for the 2017 Bush Fellowship are open August 30—September 29, 2016 and Pollen wants you to consider applying. Don’t think you’re Bush Fellowship material? You are. Four Pollenites share their experiences applying for the Bush Fellowship and who encouraged and supported them along the way. Find strength, humility, and inspiration in their stories—and then start dreaming about how you can become an even more effective leader to make big impact in your community. Also like many others, I immediately dismissed the question. “What? Who? Me? No… wow, thanks for asking, though.” For some reason, I didn’t see myself as a Bush Fellow ‘material.’ Looking back, I am not sure exactly what prompted that feeling, but I know it was there. In 2013, someone pushed back: “Why wouldn’t you consider it?”—a great question for reflection. So I did reflect, and it took awhile. I reflected on my leadership, my hope for the world, and my role in contributing to see this hope turn into reality. And one year later I applied. In order to invest in the outcomes we seek in the world, we as leaders have the responsibility to also invest in ourselves. That’s what the Bush Fellowship provides—a chance to prioritize investing in the most powerful tool in our toolbox: ourselves. We need to invest in our mindsets, energies, perspectives, experiences, skills, networks, and gifts. We must prioritize this—yes, above competing priorities—for the benefit of ourselves and the world. For anyone considering applying, hear this from me: You ARE Bush Fellowship material—because we are an intricate, diverse, complexly beautiful tapestry, and we would love for you to add your threads. The “brain drain” was in full effect when growing up in North Dakota in the 90s. Most of the talented youth were leaving the state for college and work. I wanted to join them. Not that I was talented, but I still wanted to leave. I wanted to leave wherever I was in hopes of escaping the disease of addiction that was ravaging my life. Despite that struggle and despite a mildly promising career in radio, I was not interested in remaining in North Dakota. By 2005, addiction led me to the small, dusty, pheasant-filled town of Winner, South Dakota for a radio job…and eventually a fifth DUI that began a process of healing and a journey of finding myself. Over the next ten years, I would return to college and earn a B.S., M.A., and J.D. At the University of South Dakota. Professor Sandy McKeown would help set the destinies of my life. 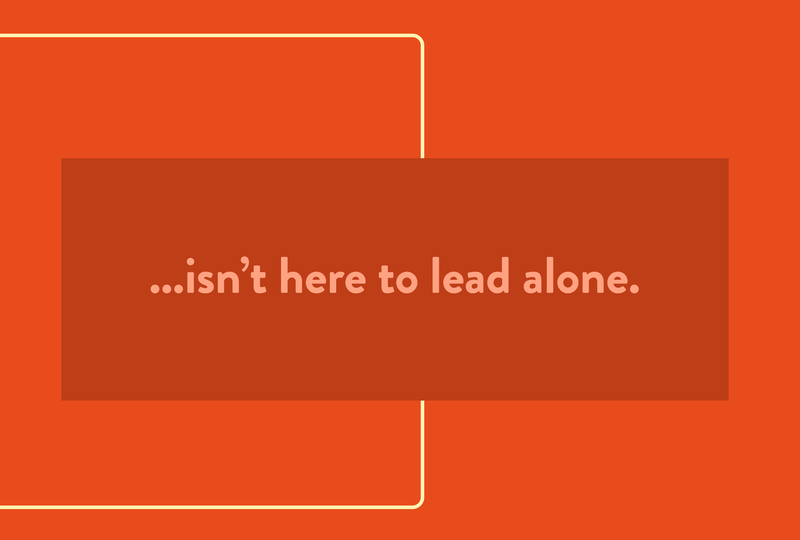 The path I began to take brought me into leadership roles both on and off campus. Landing at Face It TOGETHER was not an accident. I was connected to the founders early in the organization’s creation. But at the outset of my tenure, I was still finding my way as a leader in the organization. That’s when our team suggested I apply for the 2014 Bush Fellowship. I did not make it through the first round. At about the same time, however, I attended OTA Sioux Falls. The notion of still wanting to leave the Dakotas remained in the back of my mind somewhere, but the message of that event hit me right between the eyes: I am a Dakotan. My talents, if improved upon and applied in ND, SD, and MN could have a tremendous impact on individuals much like me—those who are lost and suffering from addiction. It was a conversation with a colleague that convinced me that I should apply again. He made it clear that “David, Inc.” was to be my focus. 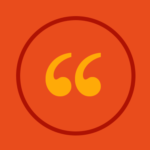 By building “David, Inc.”—giving my life a strategic vision and mission statement—I could engage and lead others to transform addiction care in our communities. I followed his advice and was named a Bush Fellow in 2015. That last year has been a rewarding, enlightening, and even frustrating year. One of my main desires was to improve my executive level skills and attend a world class executive education program. I’ve been unsuccessful in that endeavor. But, that experience of failure, coupled with other experiences while expanding my knowledge and network in the data science community, has led to a refocused effort for the last year of the fellowship. I value the positive experiences the fellowship has brought me, but ultimately I am grateful for what is being learned through failure and how that is informing who I am as a leader. I had spent years contemplating how I could take the next steps in becoming a midwife. Being a midwife is a sacrifice on many levels; you don’t make much more than a seasoned labor and delivery nurse, school is a three-year, full-time commitment, and comes at a price tag of about $100,000. I was peripherally aware of the Bush Fellowship. I had really smart and accomplished friends who had applied several times but who had been denied. In short, I didn’t think that I would have a chance. So in 2015, when a good friend, Liza, forwarded me the email with the call for applications, I glanced over it and moved on. Then she called and asked if I got the email. Then she offered to help me with edits. Liza gave me the permission to dare that I wouldn’t give myself. She pushed me to stop shrinking myself and to follow my potential. She made me question, “What if?” What a terrific friend, right? Needless to say, I’ve had almost a full year in the Bush Fellowship. The growth has been exponential. I was thrust into a world that I didn’t know existed and that I certainly didn’t feel at ease in. As a very private, introverted person, the world of networking, scaling-up, and free-wheeling was not a world that I had ever sought out. However, it is the world that Bush Fellows necessarily learn to navigate (however awkwardly) in order to make the impact they are seeking. The fellowship has a way of finding your potential and growth opportunities and pulling them out in front of you to look them squarely in the eye every day. The whole process seated me deeper in my sense of self, in my sense of worth, and my understanding of the Universal Flow. Once I chose to set the process in motion, the right people started showing up, opportunities started to present spontaneously. I will be forever in debt to the Bush Foundation. This fellowship has given me the opportunity that so many birthworkers in my community so fully deserve. The impact of educating one birthworker of color has the potential to impact generations to come. I am hopeful more in my community will consider pursuing this fellowship. If you are wondering how your life will accommodate this monumental change, if you are scared that your supporters, your family, your job will not accommodate this growth, apply anyway. The process is cathartic. It will drive you deeper into your purpose. All of those pieces that are holding your current experience will certainly shift and change, that is a necessary part of the process. To say it is easy is a lie, but nothing worthwhile is usually easy. I was encouraged to apply to the Bush Fellowship by Muneer Karcher-Ramos, currently the executive director for the Saint Paul Promise Neighborhood, and my husband, James Faghmous, currently an assistant professor and the founding CTO of the Arnhold Institute for Global Heath at Mount Sinai in New York City. At the time that I applied the three of us had co-founded a nonprofit, MuslimBuddy, to support the leadership of Muslim community organizations. We worked on strategic planning and capacity building to foster stronger and more responsive relationships between the leadership and the members they served. I made the decision to apply for the Bush Fellowship after I spoke with previous Fellows and learned about how supportive and flexible the program was to Fellows as individuals. The leadership work I engaged in then and now relies on the ability not only to execute on known best practices, but also to have space to explore new modes of operating. The Bush Fellowship allowed for both. The fellowship ending up going in a direction that I had not expected. As I was engaging with young Muslim community members, a recurring theme of empowerment kept coming up—conversations that tied to perception, ability, access, and opportunity. As I explored and thought deeper about these issues, I saw how they were connected to dress and fashion. This lead me to pursue a new course to bridge the divide between the modest values these women held and the desire for mainstream fashion. My company, Mode-sty, was founded to allow women of faith access to fashion, which in turn means access to confidence. It is well documented how empowering a great outfit can be. My work allows women of faith access to greater confidence through comfortable, beautiful clothing that supports them in their pursuit of goals. Without the Bush Fellowship, I would not have had the ability to explore, pursue, and build my company. Behind every Bush Fellow is a team of supporters, champions, advocates, and advice-givers. It’s a network of peer-leaders encouraging someone to apply for the fellowship, giving feedback on applications, and helping a finalist prepare for the in-person interviews that makes everyday leaders become Bush Fellows. Here’s a behind-the-scenes look at two of the champions, Tea Rozman-Clark and Terri Thao, who supported Nausheena Hussain in her journey to becoming a 2016 Bush Fellow. Know someone who should apply for a 2017 Bush Fellowship? Be their advocate. Support and encourage them to apply. Applications open from August 30—September 29, 2016. I met with Nausheena a couple of weeks before her Bush Fellow interview. I went through the process successfully a year prior and was eager to pass on my experience so she, too, could be as prepared as possible. I told her that the Bush Fellowships’ four hours of back-to-back interviews was one of the hardest things I had ever done in my life. Without mentors to help me, I went in without much understanding of what to expect. I was very excited she was willing to learn from me, and use my tips to power through. Clear your schedule in the days prior. Have someone drive you to and from the Bush Foundation. Focus on self care above all else. Make sure each meeting has a strong beginning and end. To avoid becoming too exhausted during those long four hours, go to the restroom between each interview and just stand there for five minutes and breathe deeply. During breaks, do power poses (assuming the body language of a powerful person can make one feel confident). I knew Nausheena was an amazing person and could be a future Bush Fellow. If she was mentally and physically prepared, the committee would easily be able to see who she is and what she is about. My goal was to help her be prepared, be herself, and to do a great series of interviews. 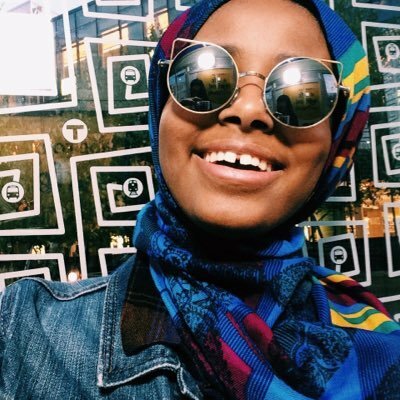 I met Nausheena when she was working at CAIR-MN and she wanted to talk about increasing civic engagement in the Muslim community. She was considering the Bush Fellowship to help achieve this work. Illustrated how her individual leadership would develop and grow as a result of the fellowship. What would she do if she did not get the fellowship? Would she still pursue this work albeit at a slower pace? I told her that this program is not a project but really about how her individual learnings would help her community. Lastly, I really became a great cheerleader to Nausheena throughout the project, telling her that she was definitely qualified for the fellowship. Political dysfunction is deeper and more pervasive than ever this presidential election year. Extremism, polarization, divisiveness, negative campaigning, voter alienation – it’s all there, and you can help stop it. Ranked Choice Voting is essential to giving voters more choice and power and combatting minority rule and the hyperpartisanship, polarization, spoiler concerns and cynicism plaguing our politics. FairVote Minnesota works to bring this critical reform to voters across the state. This year, we are working to expand RCV in multiple cities throughout the state, pass an RCV local options bill in the legislature, expanding the presence of RCV in the media, and training candidates and their teams running in Minneapolis and St. Paul in 2017. FairVote Minnesota’s interns will be responsible for assisting the Director of Campaigns and all relevant staff in executing tasks critical to the advancement of our mission. These tasks will be assigned based on urgency and importance of the needs to the organization, as well as the intern’s strengths, skills, and interests. Event interns are responsible for assisting in identifying and staffing community and political events at which FairVote Minnesota can spread the word about Ranked Choice Voting. Responsibilities include identifying appropriate events, determining the cost of participation, and assisting in planning and staffing targeted events. Field interns are responsible for assisting in outreach and field canvassing needs. They will work to create new and deepen existing volunteer relationships critical to the success of FairVote Minnesota’s mission. The field intern will also assist in developing and executing the organization’s field plan, assist in relevant database management, and document field activities. Data management interns are responsible for assisting with the transition of FairVote Minnesota’s data to a new database system and for ongoing data entry needs. The database intern will work with FairVote Minnesota staff to cultivate, structure, and refine data, as well as assist in database management. Social media interns are responsible for assisting FairVote Minnesota’s communications team on Facebook and Twitter and helping with the development of the organization’s social media strategy. Specifically, interns are needed to attend and take photographs at FairVote Minnesota events and seek quotes from supporters on why they support Ranked Choice Voting. Passionate about democracy reform and knowledgeable about Ranked Choice Voting. These internships are ideal for college students interested in political science, electoral reform, political campaigns, and related fields. Each internship is approximately 10 hours per week, and are unpaid but with options for college credit. Training will be provided for all interns and attendance at occasional meetings may be requested. Please send a brief cover letter and resume to info@fairvotemn.org. Be sure to indicate which internship(s) you are interested in and the months you are able to work. Writer, activist, organizer, and icon of gender equality, Gloria Steinem has addressed a wide range of women’s rights issues throughout her life and career. Recently, Ms. Steinem has focused her attention on the prevalence of violence against women. Global Rights for Women Executive Director Cheryl Thomas will engage Gloria in a lively conversation on what it means to be a woman in the world today and why ending violence against women and girls is so critically important. Kate Downing Khaled is on a mission to use her skills in community engagement to shape the future to be more fair and welcoming. In her work, Kate is the owner of an independent consulting firm where she facilitates creative design and equitable strategy processes for her clients. 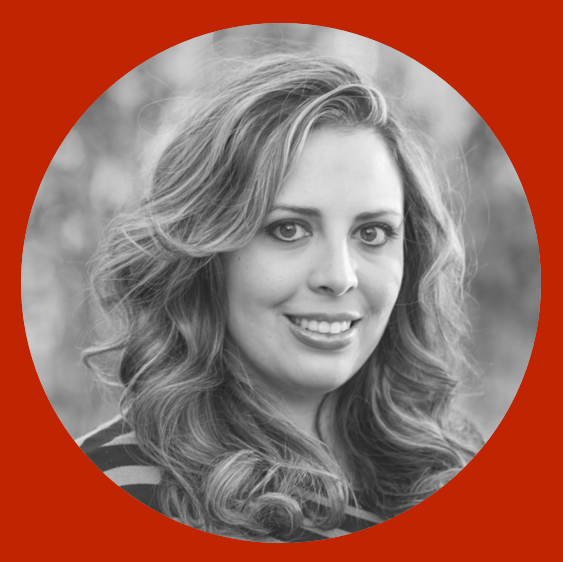 She helps them imagine, deliver and communicate programs and products that work for everyone. In her past work at Charities Review Council, she served the role of Director of Engagement & Programs, where she led the Council’s creative design, business modeling and partnership development efforts – including the development of a Diversity, Equity and Inclusion Assessment Toolkit for nonprofits, philanthropies, coalitions and municipalities. Kate previously contributed to a variety of philanthropic projects in her work with Grassroots Solutions – community problem-solving campaigns like the Minnesota Idea Open and the Connect for Health Challenge. 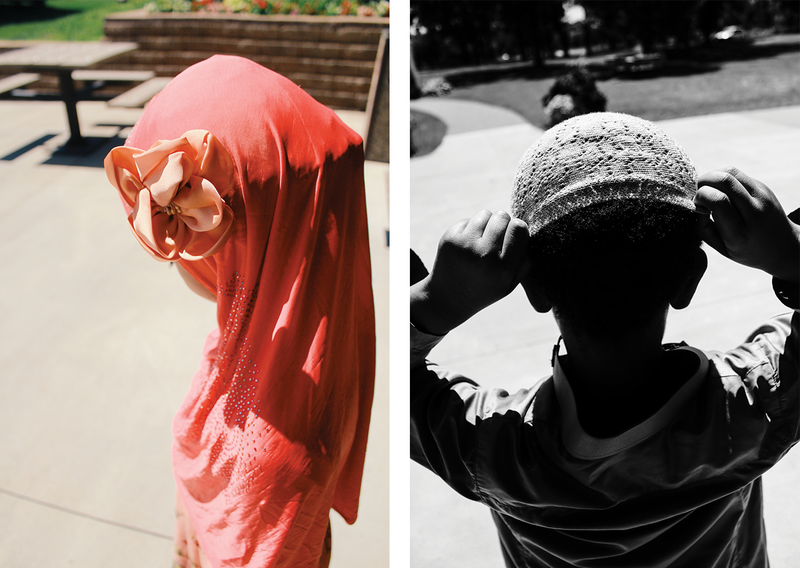 An active and vocal member of the Minnesota Muslim community, Kate lives in Saint Paul with her husband Taqee and their three sons. In her vast spare time between building a business and raising a family, you can find Kate writing creative nonfiction, refinishing mid-century furniture and enjoying Minnesota’s markets, culture and anything outdoors. Send her a personal message: kate@katekhaled.com.